Home » Lips » Lipstick » Rimmel London hits Malaysia! I saw that there was a pretty comprehensive display of foundation powder, mascara, liners, lipsticks, lip glosses but only a teeny tiny display of eyeshadow and blush. I wonder why? Anyway, I’m happy Rimmel is also now available in Kuala Lumpur, because I like their lipsticks! I did a quick search online and apparently, we are getting the Rimmel London Japan products. I know this because I purchased a lipstick in the Gloss Maxx formula which isn’t available on the UK site, but is available on the Japan site. The Rimmel Gloss Maxx lipstick in 001 costs RM19.90 which shocked me. It is actually cheaper than buying in London! 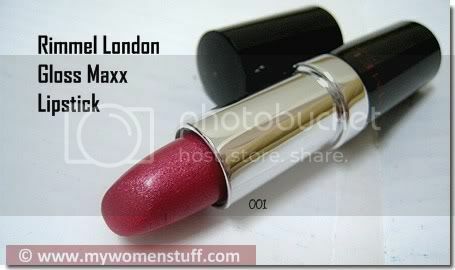 I remember seeing Rimmel lipsticks in a Boots store in London for GBP3.99 (RM25). If I recall correctly, all the lipsticks available in Malaysia are RM19.90. I chose the Gloss Maxx lipstick because it is sheer and shimmery and so gorgeous on. Its not as scary red on as you see in the picture. Also, it is fragrance free! A review will come soon. 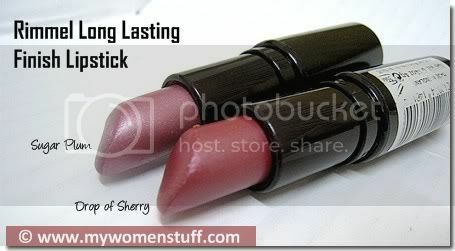 I previously owned 2 Rimmel Long Lasting Finish lipsticks purchased from London – A Drop of Sherry and Sugar Plum. I loved A Drop of Sherry so much I used it nearly everyday. It is the perfect sheer shimmery red on me that isn’t drama-mama! Unfortunately whilst I love the colour and texture, the scent got to me. There is a strong sweet scent that I dislike but some girls I know like. Its a case of personal taste. 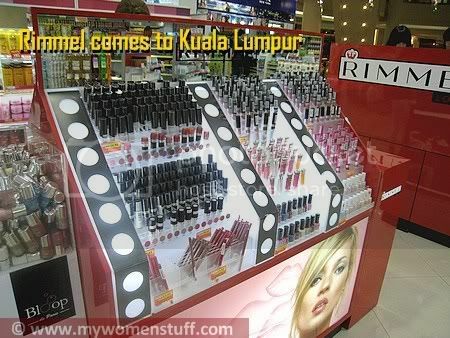 I think Rimmel is going to be available at the major Watson’s stores in Kuala Lumpur. I’m not sure about the rest of the country. If the Watsons store carries Majolica Majorca, I can safely say it should carry Rimmel. PREVIOUS POST: My experience with Majolica Majorca and a Giveaway! I need to make a trek to KLCC and soon! Especially since I work so close in the area… mmm… tomorrow’s lunch hour? Or Friday? I have to make my way to KLCC Watson’s really soon. Looks like they’ve got lots of new stuff stocked up! And the Drop of Sherry looks pretty good. I’ve been meaning to try red lips, and one without drama-mama (LOL) sounds great for starters! yeah, i checked it out in Pyramid n love the lippies! but the only problem i have when i wanted to try them out is that the butts of the lippy testers don’t show what colour is inside. so i need to take out each tester to look at the colour. i think that’s the long lasting finish range. but that aside, most of the colours suit me! madness!! 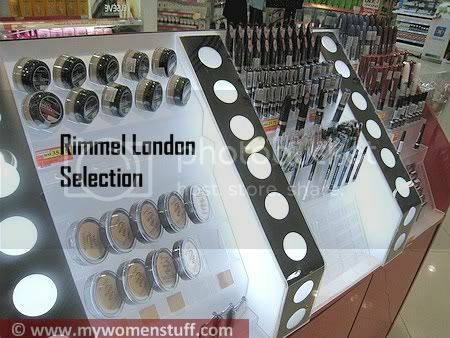 @jojoba : I was surprised to see such a huge Rimmel counter too. I think it’ll get to the other Watsons stores too. @YZ: Well they’ll be here for a while so you can wait to get the mascara. I am! @rinnah: Wooh! Go and check it out! I love the lippies and I’m hearing the mascara is good. @Connie : Yep the prices are definitely good and I’ll bear this mascara in mind! @Syen: Who knows if Sephora will get in but for now I’m loving the many new brands we are seeing. Drop of Sherry is lovely if you can handle the smell. The Gloss Maxx lippie in 001 is awesome sheer red too. @Tine: I’m more interested in getting Max Factor in too! @anis : The lippies are wonderful and I agree with you about the testers. They aren’t very friendly but hey its a small price to pay. @Plue: Wow! You must be rolling in cosmetics 😀 Yes the lipsticks in Long Lasting Finish smell very sweet. Some girls like it, I find it a bit cloying. Lucky!!! lucky!!! I would love to give the brand a try too!!! Come down to the 7,107 islands pls!!! Oh my! I remember Rimmel from my student days in London waaaaaay back in the early nineties. They had some lovely colors that I adored and saved up for! WOW! It will definitely make me walk down memory lane…….but again its Rimmel London JAPAN…..so colors will favour fairer asian skin and not Indian? and avon might be my new love! shall blog bout it soon! PB!!! Stop stop, my wallet is shrinking! @Nikki: Maybe it’ll be soon. Fingers crossed! @JackieA: The lippie colours are quite strong so darker skinned girls may find it ok. The powders and foundation had some darker shades too. I wasn’t paying too close attention sorry! Oh yes, Paris, I want Max Factor too! Max Factor, Soap & Glory, John Frieda, Sephora, COME TO MAMAAAA!!!! wow, first MJMJ and now rimmel?? hmmm drugstore makeup is starting to get really good! is covergirl coming back? max factor? how about neutrogena cosmetics? i *HEART* drugstore!! !